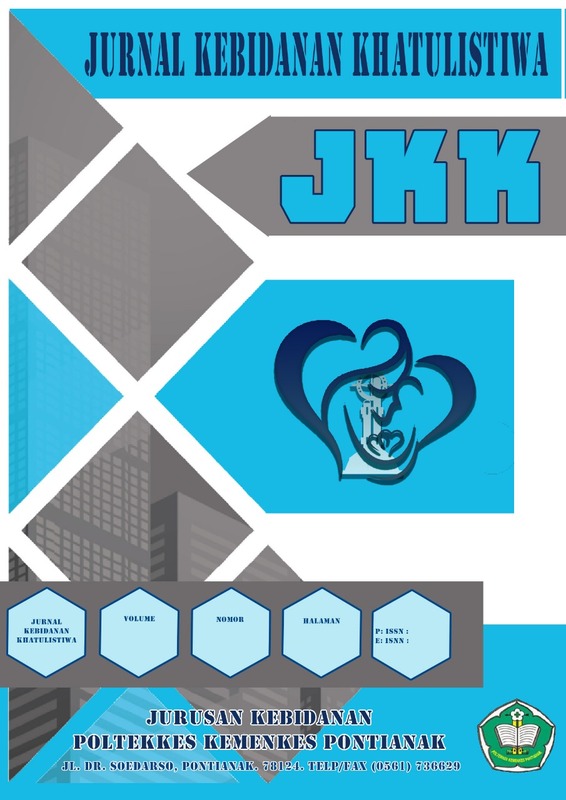 Jurnal Kebidanan Khatulistiwa (JKK) is an electronic journal published by the Department of Midwifery in Poltekkes Kemenkes Pontianak which has ISSN: 2460-1853 (Print). Articles submitted to this journal will be reviewed by a team of editors and peer-reviewer teams. Check plagiarism using plagiarism checker or other. Articles received will be available online. Those in need can download articles on this website. This journal contains scientific articles on maternal and child health. Jurnal Kebidanan Khatulistiwa (JKK) was first published in January 2015. This journal is published twice a year, as in January and July. Authors must comply with the Midwifery Journal writing guidelines for submitting articles. Every writer must register before submitting articles. And, for those who already have an account in the Journal of Midwifery, they can log in immediately. The aim of Jurnal Kebidanan Khatulistiwa is to disseminate the conceptual thoughts or ideas and research results that have been achieved in the area of midwifery health. Every article that goes to the editorial staff will be selected through Initial Review processes by Editorial Board. Then, the articles will be sent to the Mitra Bebestari/ peer reviewer and will go to the next selection by Double Blind Preview Process. After that, the articles will be returned to the authors to revise. These processes take a month for a maximum time. In the each manuscript, Mitra Bebestari/ peer reviewer will be rated from the substantial and technical aspects. Final decision of articles acceptance will be made by Editors according to Reviewers comments. Mitra Bebestari/ peer reviewer that collaboration with Jurnal Kebidanan Khatulistiwa is the experts in the midwifery health area and issues around it. Please read these guidelines carefully. Authors who want to submit their manuscript to the editorial office of Jurnal Kebidanan Khatulistiwa should obey the writing guidelines. If the manuscript submitted is not appropriate with the guidelines or written in a different format, it will BE REJECTED by the editors before further reviewed. The editors will only accept the manuscripts which meet the assigned format. Jurnal Kebidanan Khatulistiwa is licensed under a Creative Commons Attribution-ShareAlike 4.0 International License.